I have normal to combination skin, which means that my skin is oily in the t-zone area and in the warmer summer months, tends to get a little oilier. For many years, I have manually exfoliated my face with a sponge and used facial masks to help get rid of flakey cells and smooth my skin. This process takes a lot of time and physical effort, but the Foreo Luna is a wonderful device that cleanses, softens, and exfoliates the skin quickly, making it look radiant with regular use. 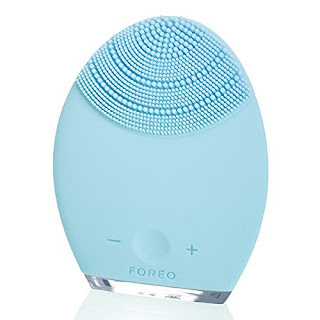 The Foreo Luna for combination skin comes in a beautiful light blue color that looks very nice placed in the bathroom or shower and the handheld device is small in size and is easy to hold. The Luna is a silicone facial brush that is designed for normal to sensitive skin and when turned on it, sets off t-sonic pulsations that help to gently and thoroughly clean the epidermal layers of the skin in a way that a sponge and mask cannot do. The device has a special anti-aging surface on the reverse side that helps to reduce the signs of aging. After cleansing my skin with the Foreo Luna, I like to place a small amount of moisturizer on my skin and use the anti-aging side of the device, which has lower pulsations and consists of a series of concentric silicone waves to smooth and tone specific areas. In my opinion, it is almost like a deep facial massage, which would take a lot more work to do if I was just using my hands. The Luna makes it all so much easier and helps to unclog pores and get rid of dirt, makeup, and oil. I also found that the moisturizer adheres and absorbs into the skin much better after using the Luna. Another good thing about the Luna is that reduces the appearance of wrinkles and fine within just a few weeks. I noticed that the lines on my forehead are less visible after using the Luna. This device is ideal for anyone that has combination/sensitive skin and it is a great alternative to regular cleansing without needing to use a heavy mask, sponge, exfoliating cleanser, or a rough facial brush. It is the perfect size for traveling and fits easily into a suitcase or purse. The Luna leaves the skin looking and feeling firmer and more elastic. It removes dead skin cells, unclogs pores of dirt, oil, and makeup residue, while enhancing the absorption of your favorite skincare products. Sends out 80,000 pulsations per minute. The creators of the Luna say that you will experience radiant skin within 3 days, but I experienced immediate results. I highly recommend this unique skin cleansing device to anyone who wants soft, clean, and radiant looking skin. You can find the Foreo Luna at www.sephora.com for $199.00.